Under the watchful eye of coach Dave McRae, members of the NDSS Golden Hawks senior boys football team work on a passing play. The team has already had a handful of full gear practices ahead of the start of the school year. Photo by Adam Prudhomme. As members of the NDSS Golden Hawks senior boys team ran through some basic drills on a muggy Tuesday afternoon, there was a common talking point among players and coaches: dedication. There was good reason for it, as upwards of 30 student athletes stayed late on the first day of school to put in a few hours of full gear practice. Several players even showed up during their final week of summer break to work on drills as they prepare for the 2018 KASSAA season. That marked quite the contrast from last autumn, when NDSS’ senior team had to forfeit its final games due to a lack of players. “They’re a motivated group,” said NDSS coach Dave McRae. Not only are they driven, but they have plenty of talent as well in what projects to be one of the deeper teams the school has fielded in recent years. Much of this group has also been training with NDSS coaches since they were in Grade 8 heading into their first high school season. Among the most experienced is Brock Vale, who returns for his fifth season. 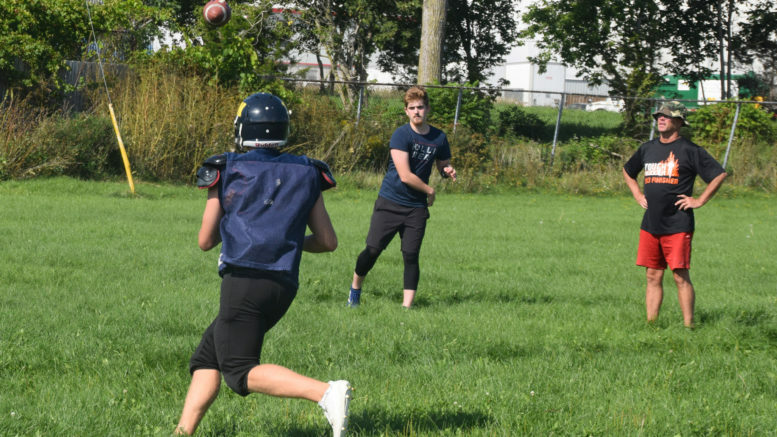 He’s seen the evolution of Napanee’s program evolve from a team fortunate to win a handful of games to one that expects to win four or five and go deep in the playoffs. Because of renovations to the track that surrounds the school’s football field, the Hawks are in the unique position where all six of their games will be on the road, as well as any playoff games. Vale says the team doesn’t see that as a problem however, as they’ve fared well on the road during his tenure and the team bus rides make for extra team bonding time. Experienced players like Vale make the coaching staff’s job that much easier as they can spread out into groups and work on their special teams. McRae says the Hawks have also drawn a favourable schedule, avoiding games against tough clubs in Holy Cross and Frontenac. Before the games start to count, the Hawks will play an exhibition game Sept. 13 against Eastside Secondary School in Belleville. They’ll use that game to help sort out the final roster positions as well as work on some plays at game speed.